Not all time-of-flight measurements are the same. 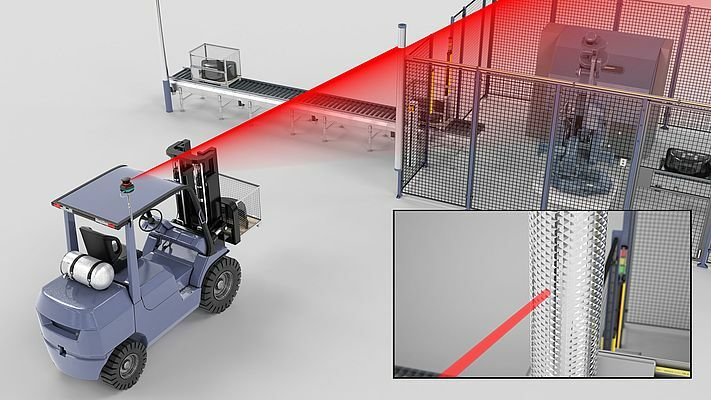 On the basis of pulse ranging technology (PRT) developed by Pepperl+Fuchs, a new laser scanner has been produced that demonstrates the advantages of this technology. To this end, further highly interesting innovations have been incorporated in the development of this device in addition to the use of PRT. For example, the measurement optics of the R2000 are based on mirror technology as opposed to the usual lens technology. The measuring module is not stationary, but rotates about its own axis. This means that the conventional mirror mechanism for beam deflection can be dispensed with. The result is a considerable increase in available space as well as identical light spot formation over the entire measurement angle. The light spot geometry is designed in such a way that the diameter does not exceed a few millimeters, even over large distances. This characteristic is important for the exact position detection of driverless transport systems. With its numerous unique features, the new 2-dimensional laser scanner is suitable for a wide variety of factory automation applications. 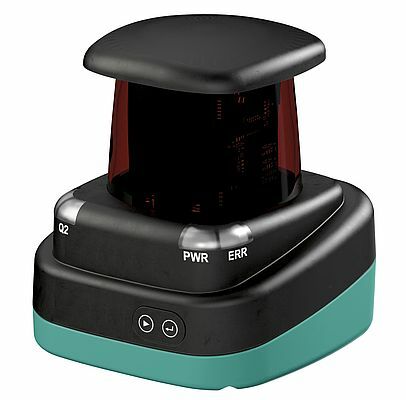 A visible red laser simplifies commissioning because the user immediately sees where the sensor is pointing and can simply align the device accordingly. Laser class 1 means that the device can be used across all working ranges without endangering personal health. The light spot has a diameter of less than 20 mm at a measuring range of up to 10 m. This feature is particularly important for the detection of small objects. The precise detection of positions and edge profiles consequently poses no problem. The measurement angle of 360°, the high sampling rate of up to 250,000 individual measurements per second, as well as a scanning frequency of up to 50 Hz mean that the device is particularly suitable for high-speed applications. An Ethernet interface is used in order to output this large volume of data. Switching outputs are available for purely binary information. A further highlight is the large display, which is integrated in the light output surface. This allows the device to be commissioned in a straightforward manner without any additional components. All that is required for the basic alignment and network configuration are the two buttons on the device. Furthermore, status messages can be generated and application-specific information, such as distances, measurement profiles, etc., displayed.